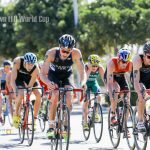 The men’s race then saw Delian Stateff and Davide Uccellari come home in first and third respectively, New Zealand’s Hayden Wilde the only man who could keep up with the flying Italians as the home crowd roared the duo down the finish. The women’s podium looked wide open from the minute Britain’s Lucy Hall and Japan’s Fuka Sega emerged from T1 with a solid advantage, only to be quickly caught up by the likes of USA’s Taylor Spivey and Chelsea Burns, Australia’s Emma Jeffcoat and Italian Alice Betto. The bike then fell into a comfortable pattern for the ten-strong lead group, who worked together on each of the five long climbs up the Viale Regina Margherita before dropping down for a winding descent that left mind and body little time for recuperation. Even by the fifth and final ascent the leaders were looking composed, leaving the chasing pack of Sandra Dodet and Vendula Frintova blowing harder in a vain hope of closing ground on them. 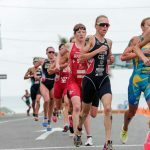 It all changed through the second transition as Verena Steinhauser began to force the pace with the Italian crowd powering her on and only Perterer, Lee and Spivey still had enough to go with her. As the rest of the field became drained by the chase, the four leaders summoned the will for an almighty final 400m. 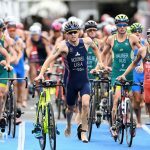 Spivey was first to make the charge, only for Perterer to dig deeper still, breaking the tape first by a fraction of a second to record a spellbinding debut World Cup win. As the wind picked up and the water became choppier ahead of the men’s race, France’s Raoul Shaw seized the moment with a superb swim that left him well out in front through T1 chased by Spain’s Uxio Abuin in the no.1 vest and a tight group that included the winner in Astana two weeks ago, Dmitry Polyanskiy. Shaw saw his opportunity to break out and opened up a 15-second advantage after the first bike lap, only to be chased down by a pack of 25 that included Belgium’s Tim van Hemel and USA’s Eli Heming and Darr Smith. Behind them, Britain’s Alex Yee worked hard to put himself in with a shout for the run section in his first race back since last year’s accident on this very course. The ASICS Development Team’s Felipe Barraza was clearly enjoying the moment too, the Chilean working his way to the front on the final long bike climb. The fastest final lap belonged to Davide Uccellari and Hayden Wilde, however, and they forced their way to the front through the final transition to leave themselves well-positioned going into the two-lap, 10km run. Uccellari’s teammate Delian Stateff looked somewhat off the pace at that stage, but as the hill picked off the weaker legs, it was Stateff who began closing in on Wilde and Uccellari, with Britain’s Barclay Izzard also remaining right in the hunt. With two u-turn bends in the final 200m to contend with, Stateff managed to pull away from Wilde and kick on to a brilliant victory, the crowds booming as Uccellari finished in third with the New Zealander in between. 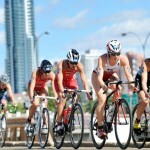 Australia’s Luke Willian came fourth, with Eli Hemming fifth. A lightening run from Alex Yee – a full 20 seconds quicker than anyone else in the field – saw him finish in eighth, one spot behind Izzard. 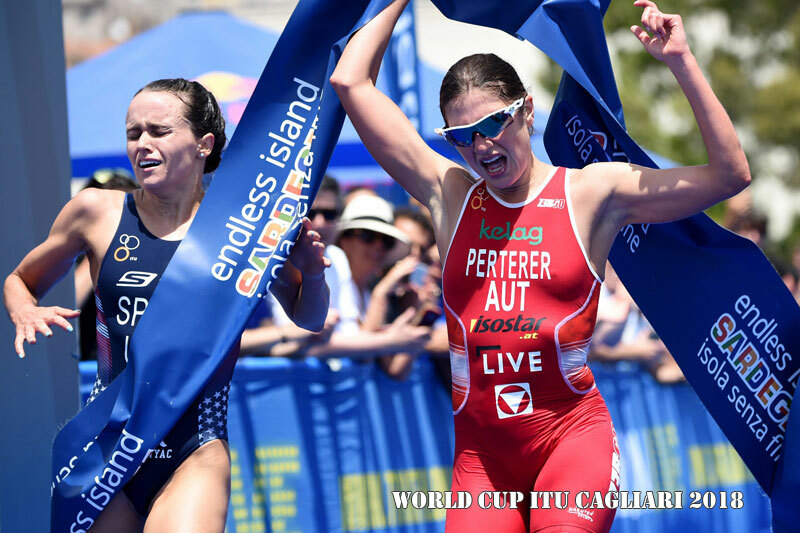 The 2018 Cagliari ITU Triathlon World Cup is an Sprint distance triathlon – 750 swim, 20km cycle and 5km run. The event will be held in Cagliari, the capital city of Sardinia, situated at the south part of the island. Athletes will find crystal-clear seas for swimming, climbs and descents for cycling and flat paths along the coast for running. While accompanying friends and family can relax on one of the many golden sanded beaches, enjoy the history, culture, entertainment and try out the countless restaurants and cafes on offer.